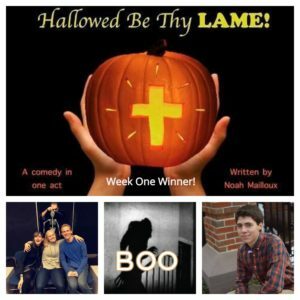 Congratulations to Noah Mailloux whose play “Hallowed Be Thy LAME!” is the week one winner of the 8th annual Players Theatre Short Play Festival – Boo! 2018. Hallowed Be Thy LAME! is a farcical play on cheesy horror and “dad jokes.” The characters in the play emulate the importance of family and connection, especially in circumstances of a recognized national holiday. The production was also directed by Noah and the talented cast included: Caylie Whiteside as Jane, Dane Anderson as Dylan, Mallaigh Ashton as Abby and Dan Taylor as the Dad.